So glad he is eating for you. Who knows why they do some of the things they do? 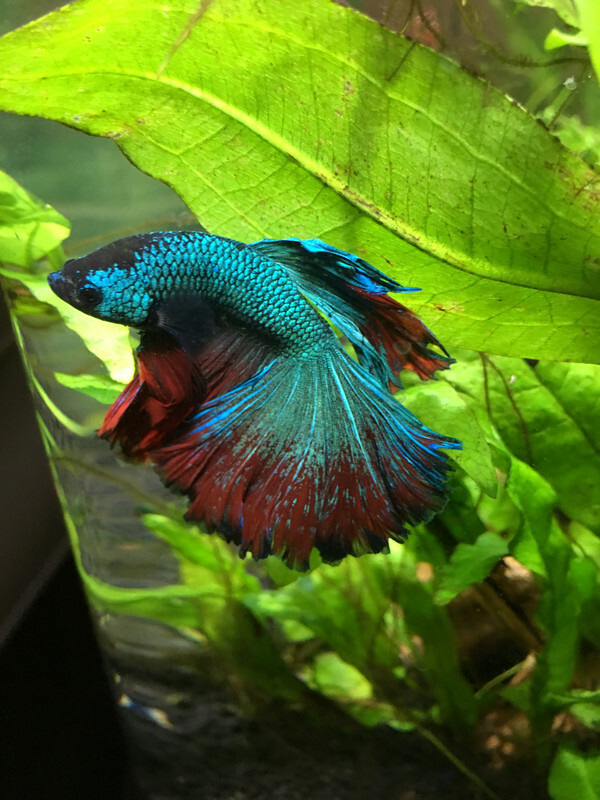 Only the Betta, I guess. Thank you so much for sharing the photos....they make me smile. I find it frustratingly ironic that the best pic I have taken so far, have been on my phone. Tagawa, is rocking a new look. As you can see from my avatar pic, he started off peacock teal and red. He has now shifted to royal blue with a teal tints in certain lights. And his fins are now rimmed with 3 mm of what looks black, but is really v v dark midnight blue. 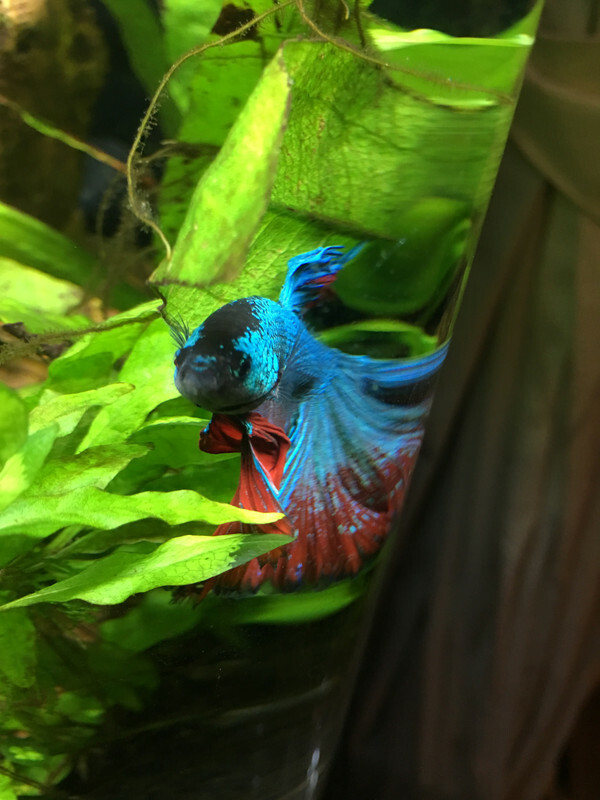 Valentine is the most flamboyantly New Romantic 80s popstar of a fish. Busy lounging on the floating plants. And happy. And greedy. The kind of fish who really needs an entourage fetching him mineral water and strawberries. And Kham,(the koi) is still dashing about his new home exploring. Far too busy to pose for pictures! Will keep trying for a good one of him. Big changes in the Samphire household. At the moment, Kham’s tank is in the spot. So that has to move. It is going to be like musical chairs. Tagawa’s tank has been moved into the kitchen. 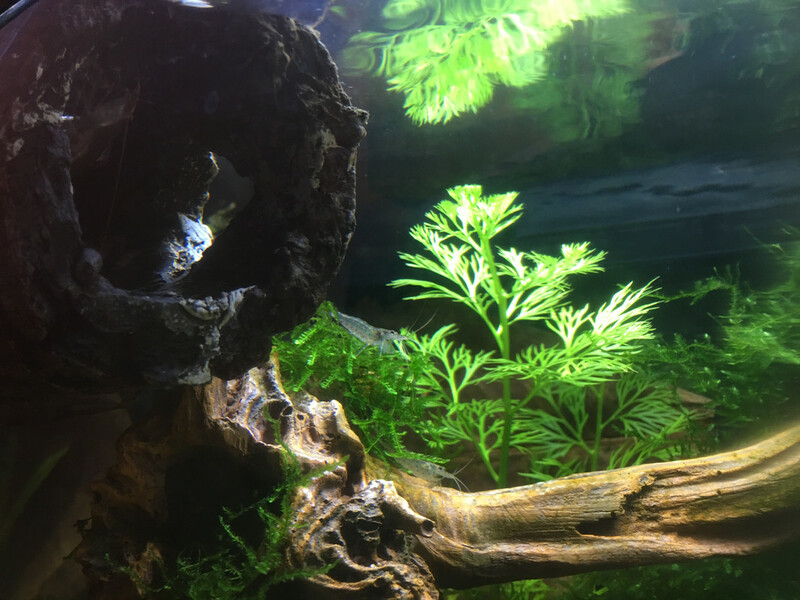 With a major revamp, new substrate, black background and some black beard algae decimation. The bba was already in retreat, but it has just been blasted by undiluted Flourish Excel, which should polish it off nicely. Tomorrow, Kham’s tank moves to Tagawa’s old spot, and the space is free for the new 200litre. 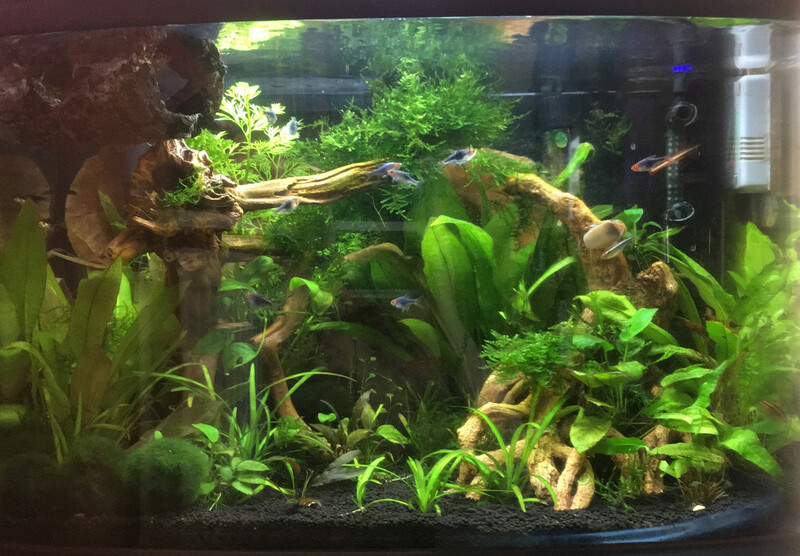 It was always awkward doing water changes for Tagawa’s old tank position (in alcove beside sofa), and hoiking out 15 gallons, including fish and plants, moving, cleaning and setting up (including cabinet) in an equally awkward position in the kitchen has left me with aches in places I didn’t know I had! Thumbs, back, neck, shoulders, even the soles of my feet! Maybe I should get to the gym before that. Lol. Tagawa seems happy with the new spot though. He kept his happy dark colour throughout the whole move, and took command of the tank in minutes, which is always a good sign. And he is loving the 2 new catappa leaves I have floated in there. He is a beautiful boy. Those colors are simply fantastic. Oh, I hear you, Young Man! I hear you! Haha! T minus 3 and I am falling behind on schedule. Mainly because I had a brainwave (which may prove a disaster) to get some of those sliding foot thingies to go under the corners of Kham’s tank stand. They arrive tomorrow. I am hoping that this will prevent the need for a complete drain before moving the tank and cabinet a whole 8 feet from one end of sofa to the other. I reckon if they can raise an entire Venetian palace on hydraulics, then I can lift a half empty 12 gallon one centimetre to get it onto the sliders. The 200litre tank suppliers rang today, apologising profusely for just discovering that the tank in question had arrived with them with black sealant, instead of the expected clear sealant. Was I OK with black, or would I prefer the clear? In which case, they would order a replacement. Delivery still scheduled for Thursday. Yes please, said I. Clear for preference. I plan to use a black background, but I still think clear sealant offers more neutral looks for if I ever change my mind and remove the backing. Have had a chance to inspect the floor in the corner under where Tagawa's tank used to be, and where Kham's tank will be by this evening. I had some mild concerns due to a problem with guttering last year, and water pooling on the ground outside that corner of the house. All sorted now, and judging by my knocking on the skirting, floorboards and wall, there is no change in sound from that corner, to other parts of the room. No soft wood or smell, or sign of damp or mildew. So the floor is obviously (according to my highly scientific test) OK to hold Kham's tank. I always go by if the floor will hold a refrigerator It will hold a tank up to 75 gal. anything past that I would want concrete under it. However in your case I think your safe. Ratvan and bluesamphire like this. The tank was moved a couple of months ago, and completely rebuilt with new Tropical soil substrate, instead of the old gravel. Reused most of the plants and roots and so on, but in a slightly different layout. Same Fluval power filter. It looked pretty dreadful for a while, with an algae bloom. The cycle wasn't broken, but the change in position, and that dratted Finnex light (I like the light, the auto features and the price, but it has caused havoc with algae) have made it quite difficult to tweak the lighting to the correct level. 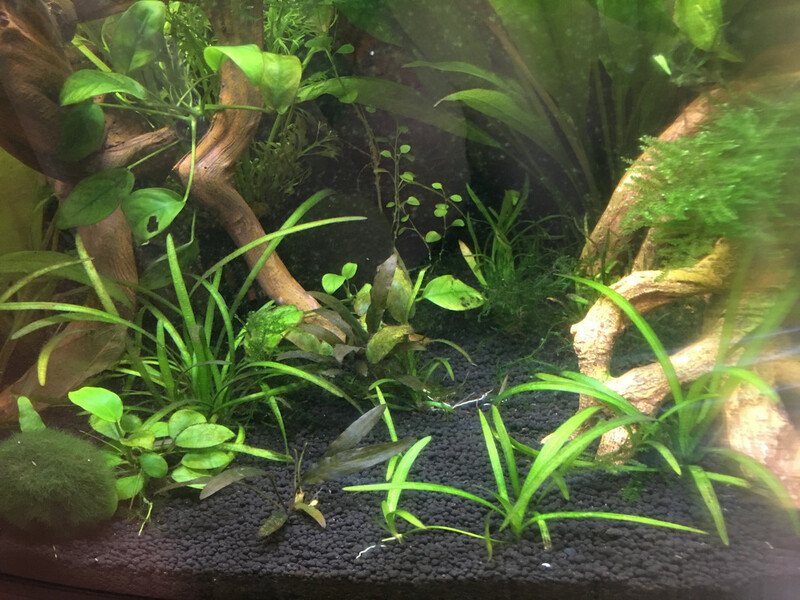 In the end I moved 2 nerites back in to keep the glass clean, and got some Amano shrimp (my first ever Amano) to keep on top of it. That and manually removing algae regularly, has helped to settle things down. Actually, I consider this tank rather a science project. Or is that a botany project? So far, in the last 4 months, I have seen green spot, green dust, black beard algae, stagshorn algae, blue green algae and both brown and green filamentous algae. All at the same time as using Flourish Excel, a little liquid CO2, adjusting the light, and removing the algae manually. This tank is a chamption aglae grower! haha! The snails and the shrimp are very happy with this, of course. I have also got good growth starting on the low plants, and no brown algae growth, so I am seeing that as a win. They will thicken up nicely soon. There are 2 wood shrimp in the tank, who have gradually changed from dull grey brown to a rather lovely orange. They hang around on the power filter and the betta log filter feeding all day. And they are more than twice the size they were. So I assume they are happy. There are actually 3 shrimp in this shot. 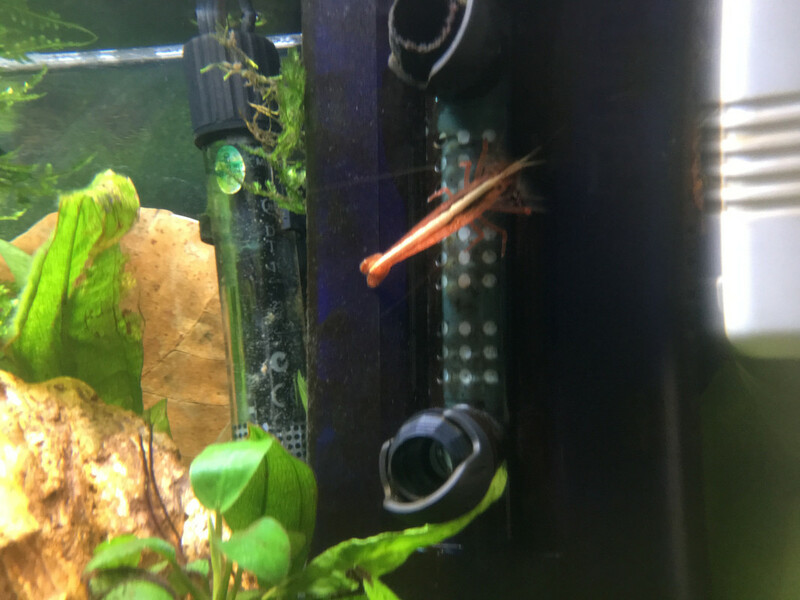 2 nearly invisible Amanos, walking along the horizontal wood, and a single bigger wood shrimp sitting in the betta log sticking his head out filtering. 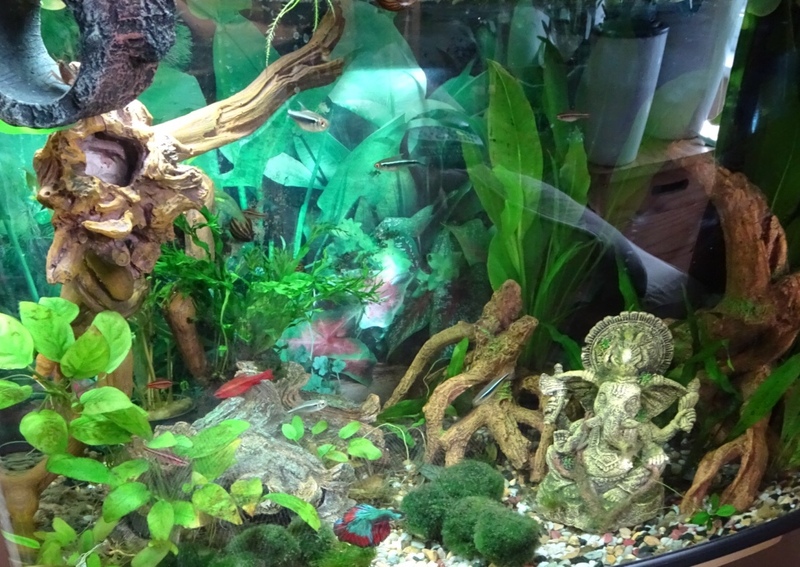 I used to have cherry barbs and black neons in here, but have moved them to another tank. 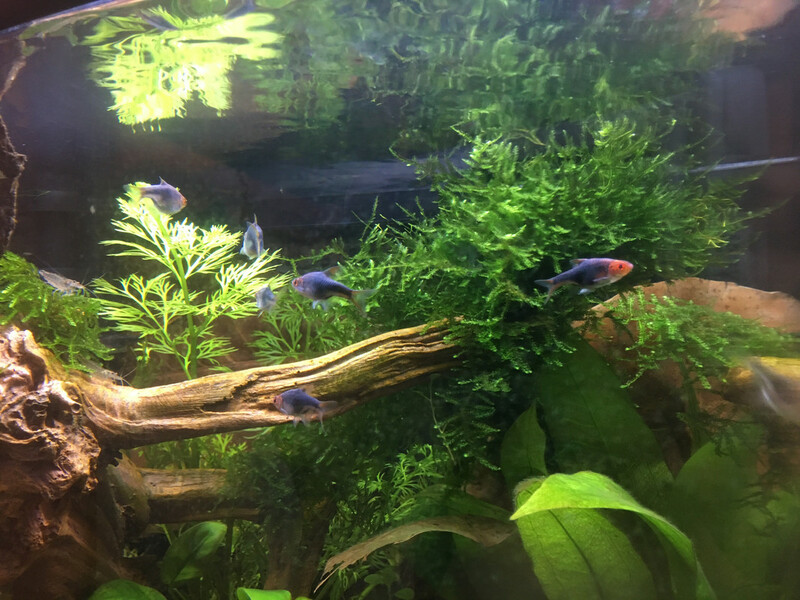 Everyone says that harlequin rasboras are good betta companions, so I went out and got 12 purple rasboras (the purple is just a colour variant on harlequin). This has not turned out as well as I had hoped. Tagawa has to be the most timid better EVER. I would call him a wimp if that wasn't derogatory. 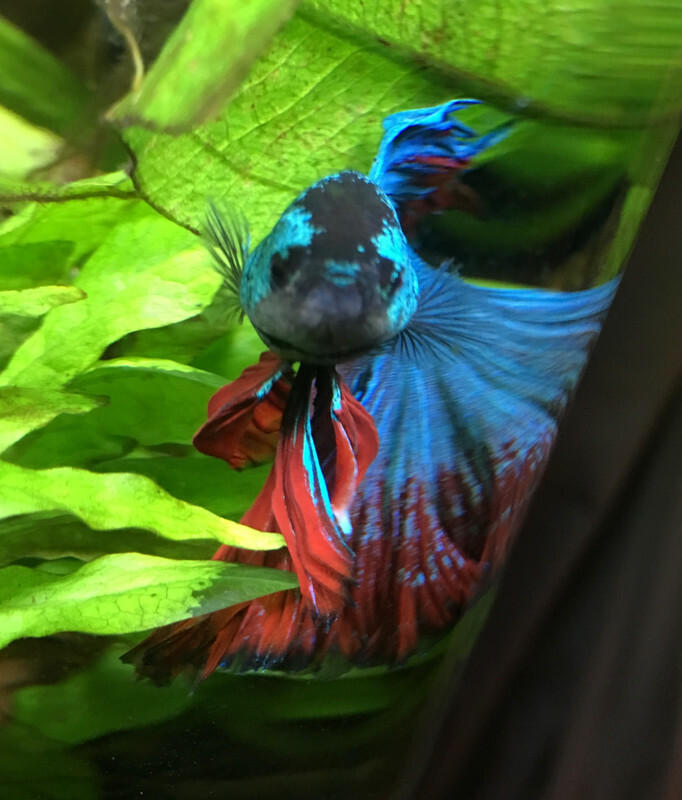 He doesn't like the rasboras. They make too much fuss at feeding time, and they hang about in the top third of the water column far more than he would like, which is where he used to rule. So he now spends most of his time scooting and lounging about the bottom, or snuggled behind/against the power filter. 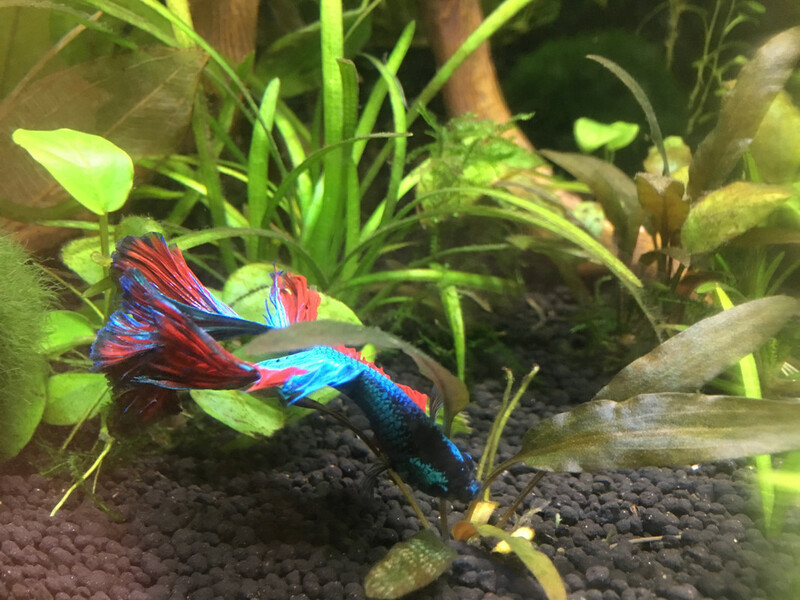 He used to take absolutely no notice of the cherry barbs and the black neons, but he doesn't like the rasboras much. 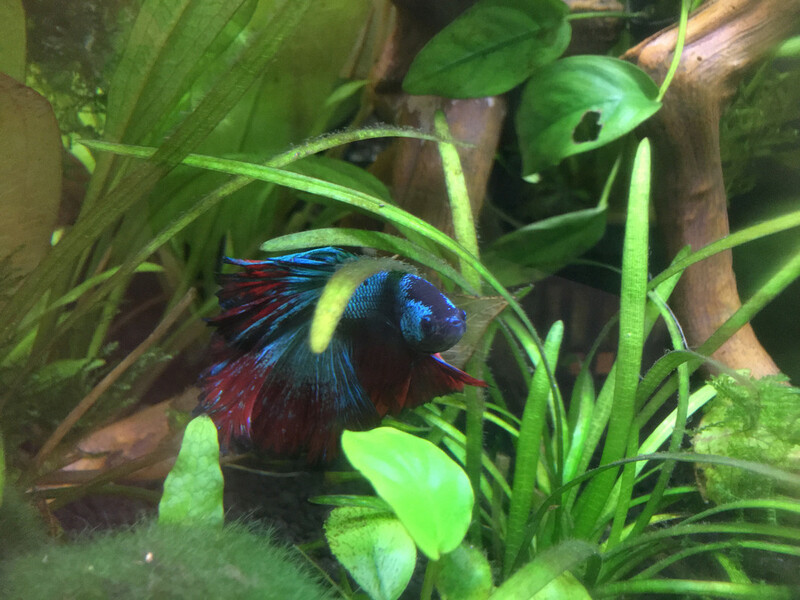 I suspect all this plant-hugging is what is causing the odd split fin. But he loves the plants so much, I am OK with a bit of damage if he gets to play and explore so much. and his colours continue to shift somewhat. The turquiose is brighter, the navy edging has stopped increasing, and the blue is speckling into the red now. He has been with me nearly 6 months, grown significantly, and has a lot more tail. Last edited by bluesamphire; 04-16-2019 at 04:50 AM. That tank looks so very beautiful. You should be very proud of what you have created for your troops. They all look happy and well fed. Hows the new 55 doing?